"We are saved to worship God. All that Christ has done for us in the past and all that He is doing now lends to this one end." In John 12 at the dinner party given in Jesus' honor Mary poured perfume on Jesus' feet. I view Mary's act as an act of worship. But some (especially Judas Iscariot who later would betray Jesus) found this as wasteful act. While Jesus sided with Mary, I think it is worthwhile to listen to experts on "worship". A. W. Tozer's book entitled Worship and Entertainment serves the purpose. "We can only worship that which fascinates us. The old poet said in an often-quoted passage, "In our astonished reverence, we confess Thy uncreated loveliness."... If you can explain it, you cannot worship it." 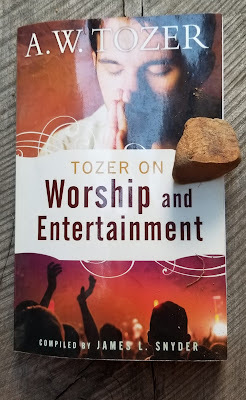 [In regard to the object of worship Tozer quotes Psalm 45:11 stating] "Worship thou Him".